Businesses of all sizes can make significant cost savings by focusing on waste in their business. Every business creates unnecessary waste. This can often be due to complacency and bad habits. 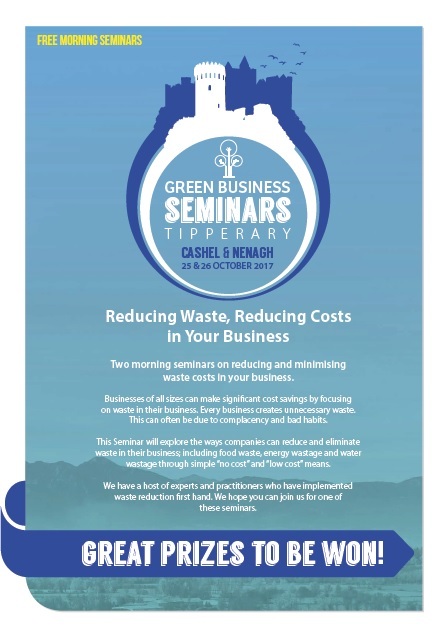 Two free Seminars taking place in Tipperary in October will explore the ways companies can reduce and eliminate waste in their business; including food waste, energy wastage and water wastage through simple “no cost” and “low cost” means. On October 25th. 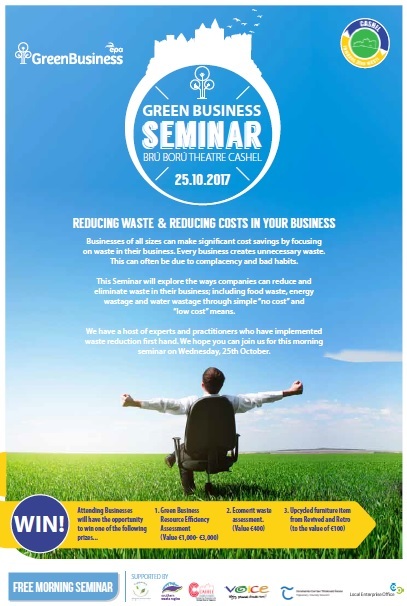 Zero Waste Cashel in association with the Green Business Programme are hosting a Seminar on ‘Reducing Waste and Reducing Costs in your Business’, in Brú Ború Theatre, Cashel (9am-1pm). On Thursday 26th, Tipperary Green Business Network in association with the Green Business Programme will host a Seminar in the Abbey Court Hotel. Nenagh (9am-1pm). Both events will feature experts and practitioners who have implemented waste reduction first hand, including Derry O’ Donnell, Zero Waste Cashel, James Hogan, Green Business Programme (Cashel and Nenagh), Sarah Broderick, Clean Technology Centre, CIT, Pa Finucane, Django’s Hostel, (Cashel), Alan Jackson, & Paul Kenny, Tipperary Energy Agency, (Cashel, Nenagh), Conor Stakelum, Stakelums Office Supplies, Margaret Murphy Southern Waste Region Management Office, (Nenagh) Phil Walker, EcoMerit, (Nenagh) and Dave Corboy, VOICE Recycling Ambassador and Revived and Retro (Nenagh). 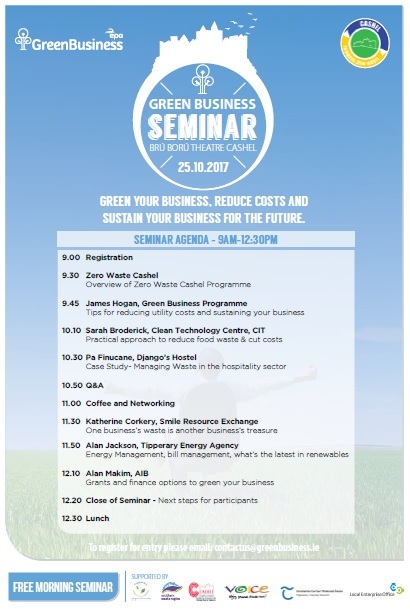 Alan Makin of AIB will speak at both events on Grants and Finance options to green your business. Bernie Kiely, Dept. 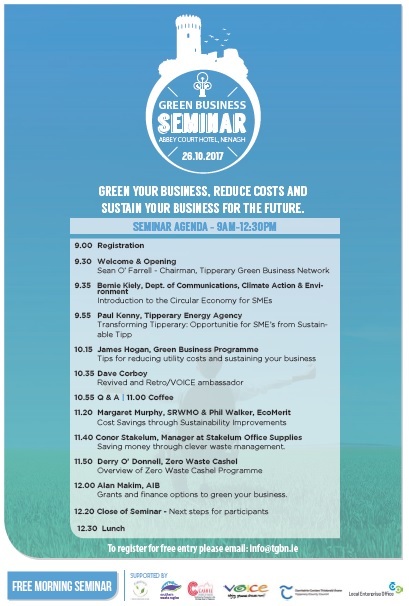 Communications, Climate Action & Environment will give the keynote address at the Nenagh Seminar on ‘An introduction to the Circular Economy for SMEs’. Over the last 10 years the Green Business Programme has identified over €10 million worth of savings for businesses. Savings identified have ranged from €250,000 in one business to €2,500 in another. Regardless of the size of the savings, the impacts of resource efficiency and cost reduction are important for all business sizes. Reducing utility costs by €2,500/ annum is equivalent to increasing sales by €25,000, when there is a 10% profit margin. Both events are free but booking is essential. Businesses who attend these seminars will be in with the opportunity to win one of the following prizes being offered by the organisers.